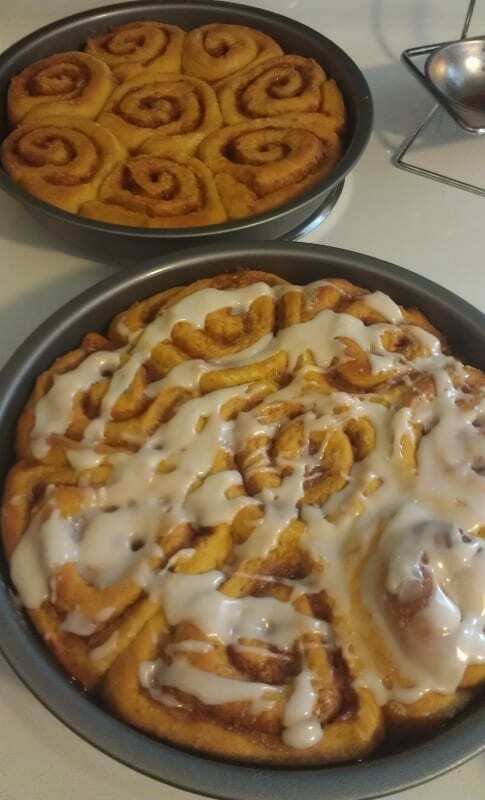 Earlier in October I read the recipe for Pumpkin Cinnamon Rolls and decided I had to make them. Late every year, I feel the need to cook things that fill my house with smells of cinnamon and other warm spices. I’ve been lax in my creation of autumn treats this fall, sadly. 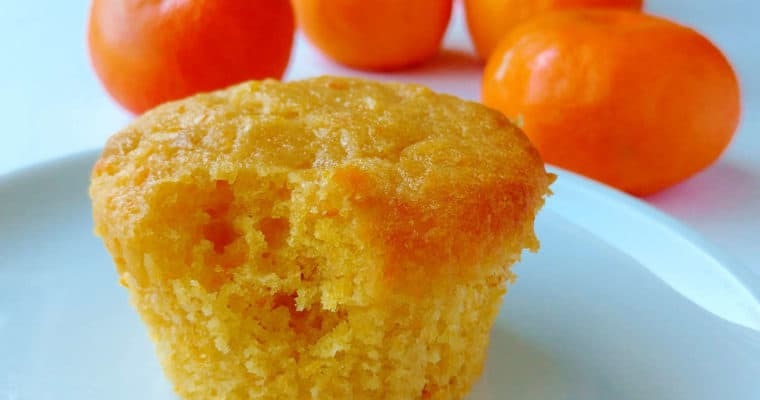 Making something pumpkin for breakfast would fulfill dual desires – the desire to bake for autumn, and the desire to make myself a special breakfast on a weekend morning when I can enjoy it. 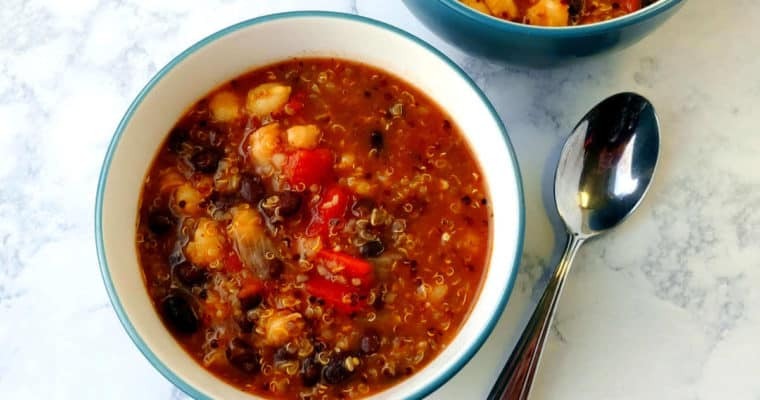 I didn’t make many tweaks to this recipe. I used margarine in place of butter, and had 2% milk in place of whole. I included 1/2 cup white whole wheat flour with the flour to add a tiny bit of fiber, and I cut back on the salt since I was using margarine in place of unsalted butter. I omitted cardamom, and grated fresh nutmeg (which is intensely fragrant – I recommend it) for the spices. I omitted a cream cheese glaze and made a simple powdered sugar glaze instead, using half the recommended amount of sugar; this amount of glaze was plenty for the rolls. Cinnamon rolls are not difficult to make; they just take a little time, since the yeast dough requires shaping and two rounds of proofing. The first thing I did was heat milk in the microwave, took its temperature with my handy probe thermometer (affiliate link) to make sure it wasn’t too hot, and stirred in the active dry yeast to let it proof for a few minutes. While the yeast proofed, I melted 1/4 cup margarine, and assembled my dry ingredients in the stand mixer. I mixed in the melted margarine, and then added the milk, egg, and canned pumpkin. Using the dough hook, I mixed the dough on low (speed 2) for 5 minutes, until it was smooth and stretchy and dough-like. Using a rubber spatula (the dough was very sticky), I scraped the dough into a greased bowl and covered it with plastic wrap. I warmed my oven for 1 minute, shut it off, and stashed the dough in there to rise for 1 hour, until doubled. Once the dough had risen, I dumped it out on a floured surface. You’re supposed to roll the dough into a 16×11 inch, but the dough is pliable so you can use your hands to pat it out most the way. I used the rolling pin to finish getting the dough into shape. I brushed the dough with more melted margarine, and sprinkled a mixture of brown sugar, granulated sugar, and cinnamon over the dough, patting it out to the edges. I rolled the dough up along the long edge, and cut it into 16 rolls. I placed them cut-side down into two greased 9-inch round cake pans, covered them with plastic wrap, and stored them in the fridge to rest overnight. I pulled the rolls from the fridge the next morning. I preheated my oven for 1 minute again to create a warm environment for the bread to rise, and put the rolls in there for about 90 minutes (the length of time Alex and I took to go for a long run). After removing the dough from the oven, I preheated it to approximately 350F, and baked the rolls for 17 minutes; if you have an oven that doesn’t bake things super-fast, you should probably bake the rolls for 25 minutes as the recipe recommends. My cinnamon rolls reached an internal temperature of at least 190F, and that was done enough for me. I concocted a thick glaze of 1 cup powdered sugar, a couple tablespoons milk, and a tiny bit of vanilla, and spread it over the rolls. The pumpkin cinnamon rolls were pretty good. 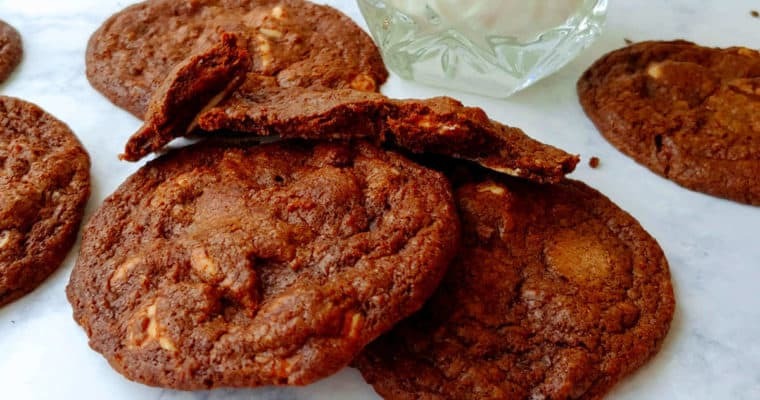 They were clearly better fresh than as leftovers, but what baked good isn’t? The earthy taste of pumpkin was definitely there (if you know what to look for), and the unusual flavors of ginger and nutmeg gave the rolls a decided autumn flavor. Fresh, the rolls were soft and chewy, exactly the texture you’d want out of a cinnamon roll. Although these were good cinnamon rolls, Alex and I ultimately prefer regular cinnamon rolls over the pumpkin version. 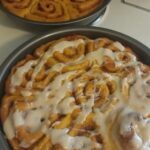 The addition of pumpkin and a couple of extra spices was different, but not better, and I’ve made other cinnamon rolls which I enjoy more. I doubt I’d make these again, but I am glad that I tried them once. You might enjoy them if you like pumpkin and autumn flavors more than I do. Want more cinnamon rolls? You can try these cinnamon rolls with cream cheese glaze adapted from Smitten Kitchen; cinnamon rolls adapted from the Bread Baker’s Apprentice (affiliate link); these overnight cinnamon rolls adapted from Alton Brown; these super-tender, quick and easy cinnamon rolls; or these gluten-free cinnamon rolls if you need to make something gluten-free. 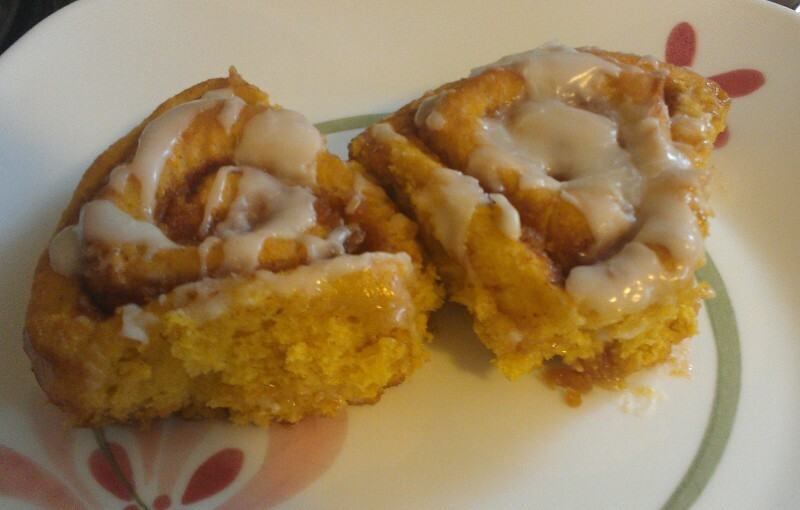 Pumpkin cinnamon rolls are a delicious fall breakfast! Combine warm milk and yeast in a small bowl. Set aside. If it's not foamy after 5-10 minutes, try again with a new container of yeast. In the bowl of an electric mixer, combine flour, sugars, salt, and spices. Add 1/4 cup melted butter and stir to combine. Add milk mixture, pumpkin, and egg, and mix until combined. If you haven't been using your dough hook, switch to it now and knead on low (speed 2 for me) for 5 minutes, until dough is stretchy and smooth. Place dough in an oiled bowl and cover with plastic wrap. Let rise for 1 hour, until about doubled. Grease your 9x13 inch pan (or two 9-inch or 8-inch pans) very well. Or line the bottom with parchment paper and grease the sides of the pan. Turn dough out onto a floured surface and sprinkle the top of it with flour. Roll out into a 16x11 inch rectangle. You may be able to use your hands to pat it most of the way there. Brush with remaining 2 tablespoons melted butter. Stir together remaining ingredients for the filling, and sprinkle evenly on the dough. Starting with the long side, roll the dough into a tight roll. Use a serrated knife to gently saw the log into 1-inch sections. Place the dough in the pans, cut side up. Sprinkle with any cinnamon sugar that fell off them. Cover the pans with plastic wrap and let rise for 45 minutes. If making the next day, place them in the refrigerator overnight. If making the next morning, pull the pan out 60-90 minutes before you would like to bake them, to let them finish rising. 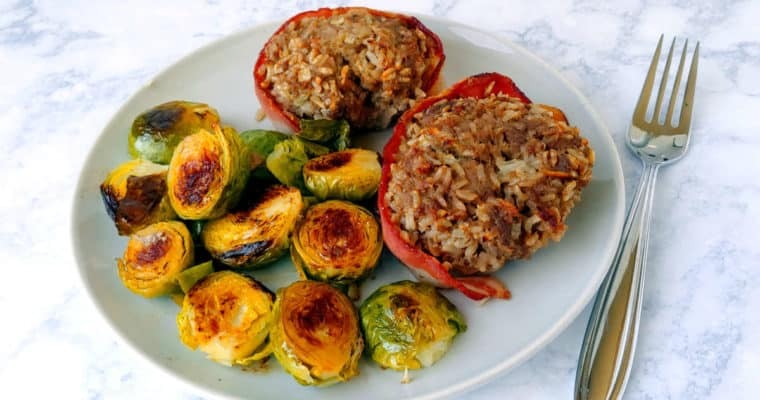 You can assist this by preheating your oven for 1-2 minutes, turning off the heat, and placing the covered pan in the oven. This is particularly helpful if your kitchen is cold. Remove plastic from the pan and bake buns at 350F for 17-25 minutes (the shorter time only if your oven bakes super-fast like mine does), until the buns are puffed and golden. 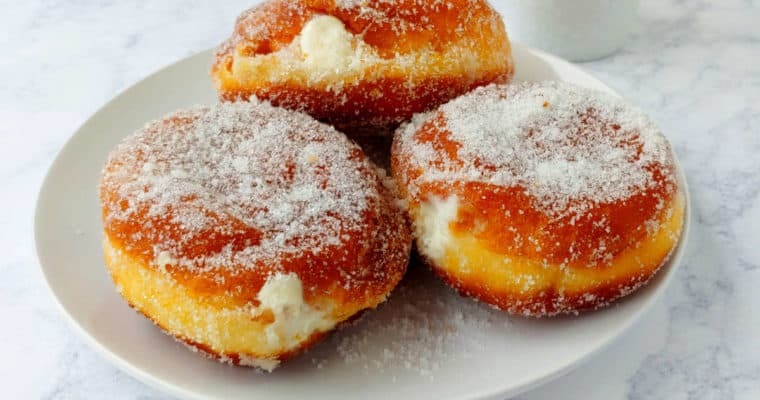 Combine powdered sugar with vanilla and enough milk to make a thick glaze. Brush over warm buns. Serve immediately. Buns are best the day they are made.